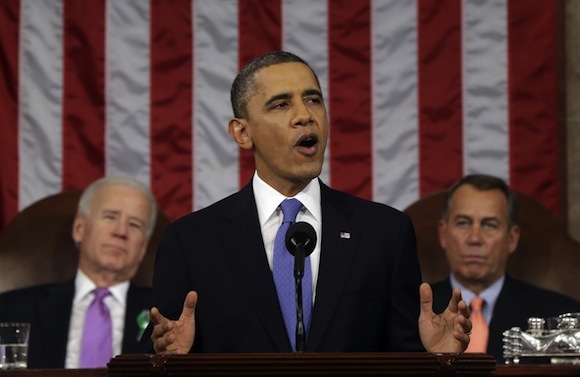 In his State of the Union address, President Obama highlighted growing inequality in the U.S. He also pledged to take steps to reduce greenhouse gases in the atmosphere. What has the Obama administration done recently on both counts? First, it has agreed to a new budget with the Republicans that didn’t renew benefits for the long-term unemployed. This will immediately impoverish 1.3 million workers. Every day a new batch of the unemployed becomes part of the long-term unemployed. Obama delivering the 2014 State of the Union address. AP Photo. Even if the unemployment benefits were now somehow enacted (unlikely), Obama was only asking that they be extended for three months. But an extra three months wouldn’t make a dent in what has become a hallmark of the weak recovery – the growth of the long term unemployed. Obama’s solution? He recently called together a group of CEOs of major corporations and pleaded with them to hire more of the long term unemployed. They promised to think about it. The new budget restored some of the sharp social spending cuts directly affecting workers that went into effect under the bipartisan “sequester” agreement of last year. But not all, so many of those cuts remain. Second, a new bipartisan farm bill continues massive subsidies to Big Agriculture, while cutting food aid (“food stamps”) for the poorest section of the working class by nearly $9 billion, coming on top of the sequester cut to the program of $5 billion, which was not restored in the new budget. These cuts in already inadequate food aid will hit 1.7 million, many of them children. Black and Latino people will be especially hard hit. 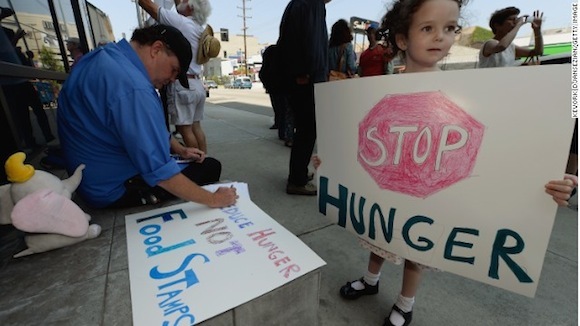 Before the sequester cuts, his food stamp allotment was $206 a month. Now it will be cut even below $176, which is less than $6 a day for a 30 day month, about enough for one cup of coffee and a pastry at Starbucks. Walmart, which caters to working class customers, complained of a loss of revenue in January because the earlier sequester cuts to food stamps meant that poorer workers did not have much money left for anything else. It was largely the Occupy movement of 2011 that raised public awareness of growing inequality. One movement that has come out of that is a struggle to raise the minimum wage. This has two aspects. One has been strikes and demonstrations at Walmart and fast food outlets for such a wage increase. The other is demonstrations and ballot measures at the city and state levels to raise the minimum wage by law. Some Democrats have supported such efforts, but not all, and the Republicans are opposed. It’s not only the capitalists in the low-wage sector who resist raising the minimum wage, but the owning class as a whole, since raising the minimum wage will have the effect of raising all wages. The present federal minimum wage is $7.25 an hour, well below its historic level. Obama proposes a minimum wage raise to $10.10 an hour, still below the historic level. He can make that proposal knowing full well that it cannot pass Congress. The two-party shell game goes on. The Fight for 15 campaign started the national conversation about raising the minimum wage; Obama’s attempt to coopt the message with a $10.10 minimum wage proposal is an insult to the movement and to low wage workers. Photo by Aaron Cynic, Chicagoist. On Obama’s promise to reduce carbon emissions, there are two things to note. Shortly after his State of the Union address, a report was issued by the State Department that the proposed X-L pipeline to bring tar sands oil sludge from Canada over 1,000 miles down to the Gulf Coast for refining would have no impact on carbon emissions. The report’s reasoning was that even if the pipeline isn’t built, the tar sands oil would be sent anyway, by truck or train, so there would be the same effect on carbon emissions if the pipeline was built or not. The whole process of extracting oil from the tar sands sludge itself adds to pollution in general to the water and air, and to carbon emissions in particular. Tar sands oil is especially dirty. Even after the process of liquefying it so it can be transported, it is so dirty that the refining process produces more pollution. Whether it comes by truck, train, or pipeline there will be leaks, fires, and explosions to boot. The tar sands oil should be left in the ground, and not transported across the U.S. or Canada in any fashion. Obama will not issue such a ban, of course. 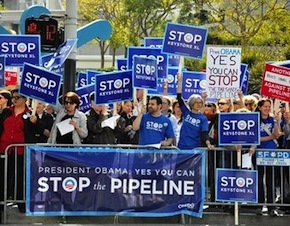 While it would be a partial victory if Obama is forced not to approve the pipeline, the struggle would have to continue. Obama’s real program was contained in another major portion of his address. There was triumphal boasting that U.S. production of natural gas and oil had reached new levels, and would continue to expand, due to new technology. That technology is fracking,1 although he did not use the word because it has become associated with pollution of water and the triggering of earthquakes. Obama promised greater and greater reliance on and production of fossil fuels – bad news for the environment. Growing inequality between the capitalists on the one hand, and the wage workers and other producers on the other has accelerated since the Great Recession. But it has been developing over decades, under both Democratic and Republican administrations. This has resulted from the workings of the capitalist system itself, which is based on the existence and furtherance of inequality. It has been made worse over these decades by the erosion of the labor movement, which has been unable to counter the capitalist offensive against workers, either economically or politically, as it remains tied to the capitalist Democratic Party. The slow but sure destruction of the environment has also proceeded apace. Obama’s boast about new oil and gas production in the U.S. means it has a leg up on its imperialist competitors. Energy costs for industry in the U.S. are 50 percent of what they are in Europe. The imperatives of capitalist competition inexorably drive to increase fossil fuel production and weaken environmental regulations. Already there is talk in the European Union of cutting back on its regulations. What should the response of the U.S. working class and the working class in the rest of the advanced capitalist world [be]? ….The only possible answer to capital’s unlimited decades-long assault on labor is to unleash a class struggle from below in response. The revolt of the underlying population therefore must take the form of a general political offensive against what is an unequal and irrational system. If the future of humanity and that of capitalism can be said to have coincided at one time, this is certainly no longer the case today. All reality and all hope demand a new system of production and consumption, beyond capital and beyond mere wage labor. 1 See our recent article on resistance to fracking by Ellis Boal.